Beckley Canopy Therapeutics, based in Oxford, England has raised ₤7.4 million for the purposes of cannabinoid research and drug development. The new company is a unique partnership established between Canopy Growth Corporation and the Beckley Foundation, a research institute which examines the utilization of psychotropic drugs for the treatment of physical and mental conditions. Studies focusing on the use of cannabinoids for the treatment of opioid addiction and cancer pain will be conducted in Europe, the UK and the US. Here is the first reason: the woman behind it all. 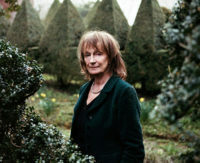 Her name is Lady Amanda Feilding, Countess of Wemyss and March. Born into a landed gentry family at Beckley Park (a Tudor hunting lodge with three towers and three moats) she also has a long history of engaging and supporting scientific endeavours that use stigmatized drugs in the treatment of both intractable disease and mental illness via the use of scientific research. In 1998, Amanda Feilding set up the Beckley Foundation, a charitable trust which initiates, directs and supports neuroscientific and clinical research into the effects of psychoactive substances. She has also co-authored over 50 scientific papers in peer-reviewed journals. The so-called “hidden hand” behind the rebirth of psychedelic science, Fielding’s contribution to global drug policy reform has been widely acknowledged in international drug policy circles. She was named as one of the bravest men and women in the history of science in 2010 by the British Guardian. And here is the second reason: The foundation is now partnered with Canopy Cannabis, one of the leading cannabis firms in the world, which is also working closely with Spanish opioid manufacturer Alcaliber. In other words, this coalition is almost the mirror opposite of the approach taken by the American Sackler family, makers of Oxycontin, who have fought cannabinoids as an alternative or even transition drug in multiple state legalization campaigns. Meanwhile the death rates from overdoses have quadrupled since 1999. In 2016, opioid-related drug overdoses killed about 116 people a day (or about 42,249 for the year). It is estimated that about 11 million people in the U.S. are currently misusing or dependent on opioids. While opioids clearly have a role particularly in chronic pain treatment, the question now at the global scientific table is this: Are cannabinoids a substitute for longer term chronic pain management? It is a fiercely battled scientific debate that has frequently, particularly in the U.S., crossed over into political drug reform questions. The unique partnership of Beckley and Canopy is well placed both scientifically and culturally to take on a discussion which has languished for too long in the grass of political debate and reform. Even better, it is taking place in a country where English is the first language, but outside the U.S. and further, in a country where cannabis has now been legally reclassified as a Schedule II drug. Do not expect, in other words, the same trials and tribulations that faced noted U.S.-based researcher Sue Sisley, to slow down research, trials or findings. Why Is A Cultural and Scientific Reset Required? For the past forty years, since the end of the 1970s, cannabis in particular, has been pushed into a strange scientific territory in part, because of the culture surrounding the drug. This in turn, along with the schedule I classification of cannabis, has led to not only a dearth of research, but a reluctance on the part of prescribing doctors to examine its efficacy. In the present, this means that doctors are still (beyond insurers who demand medical evidence before approving payment) the biggest hurdles in every medical system where cannabis is becoming legal. See the debate in Canada, the UK and of course, Germany, where patients frequently report asking for a drug their doctors refuse to prescribe. This is exactly the kind of high-placed, societally influential effort in other words, that might finally break the medical taboo at the most important remaining logjam– at the point of prescription and approval for patients. By Brian Blumenfeld, J.D., M.A. As CIJ readers are probably aware, last month Congress passed the Consolidated Appropriations Act of 2017—the annual budget, in other words. Lying within this 1,665-page document is Section 537, which for one year restricts the Department of Justice from using any funds to prevent states from implementing their medical cannabis laws. Medical cannabis businesses and patients can take some solace in this restriction. Last summer, the influential U.S. Court of Appeals for the Ninth Circuit, sitting in San Francisco, confirmed that this appropriations rider prevents federal prosecutors from bringing suit against medical cannabis businesses and users operating in compliance with state law. Two problems remain glaring, however: one, the protection only applies to medical cannabis activity, not recreational; and two, it is only guaranteed to last for one fiscal year. To be sure, for the 115th Congress to address the profusion of issues emerging from the nationwide legalization movement, they must do something more. Various reform proposals have in fact been introduced during the current congressional session, and in order to fully digest where they stand and what they have the potential to accomplish, it will help to make sure that we know how they fit within federal legislative procedure. Whenever confronting a question about government and politics, it is never a bad idea to start at the source of authority. In America, that source is of course the Constitution, and in Article 1, Section 5, Clause 2, We The People have given to Congress the power to “determine the rules of its proceedings”. When we remember back to the School House Rock cartoon for How A Bill Becomes A Law, the majority of political maneuvering behind the basic process taught in the cartoon actually happens according to these ‘rules’ or ‘resolutions’. In fact, at the beginning of each new Congress (every two years) each chamber, and each committee and subcommittee within each chamber, votes on the rules that will govern how they are to go about their legislative business. Traditionally, the rules from the previous Congress are carried over by this vote with only minor tweaks. On top of that, both parties in each chamber have their own internal rules and procedures for setting their policy agenda, directing political strategy, and determining which members will be nominated to certain leadership positions and committee posts. Playing the game of politics according to this layer cake of rules is a necessary part of the work of a legislator, and is often as important a factor in how our country is actually governed as is who wins election to office and what substantive provisions are formally enacted into law. So for the purposes of understanding federal cannabis reform, let’s take a quick look into the procedural status of the relevant legislation and who is in a position to influence what happens to it; then, when reviewing the policies they stand to codify, we will also understand the legislative landscape they must navigate. 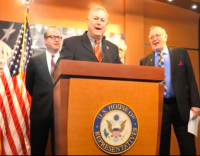 A good place to start is February 16, 2017 when Republican Congressmen Dana Rohrabacher (R-CA) and Don Young (R-AK) along with Democratic Congressmen Earl Blumenaur (D-OR) and Jared Polis (D-CO) launched the Congressional Cannabis Caucus. Under House and Senate rules, such a caucus must formally register with the House Committee on Administration as a Congressional Member Organization (CMO), disclosing its officers and members and declaring its purpose. These CMOs are sometimes referred to by different names: caucuses, conferences, coalitions, task forces, etc. The best known of these are the House and Senate Democratic Caucuses and the House and Senate Republican Conferences. By setting party policy, driving legislative strategy, promoting party cohesion and rewarding party loyalty, these largest of CMOs dominate partisan activity on Capitol Hill. Smaller CMOs, on the other hand, advance only specific interests and often cross the partisan divide. The Cannabis Caucus, for instance, was formed to catalyze a federal response to the nationwide legalization movement, and its “Path to Marijuana Reform” is a large part of the spate of bills that have been dropped into the congressional hopper over the past six months. All in all there are twenty cannabis reform bills currently pending in Congress. In the House, all but two of the fourteen bills there have been referred to either the Energy & Commerce Committee or the Judiciary Committee, and all but one of the six in the Senate have been referred to either the Finance or Judiciary Committees. Under House and Senate rules, bills are referred to committees by matching the former’s subject matter to the latter’s jurisdiction. In the House, the Speaker may attach time limits for committee action, refer a bill or portions of a bill to multiple committees and determine the sequence in which they are to be considered. The Speaker may also convene an ad hoc committee to consider a bill, and “make such other provision as may be considered appropriate.” As can be gleaned, the Speakership holds substantial procedural powers, and is in fact the only congressional leadership position created by the Constitution. The Senate’s counterpart, the majority leader, has in comparison less discretion in moving along legislative business. 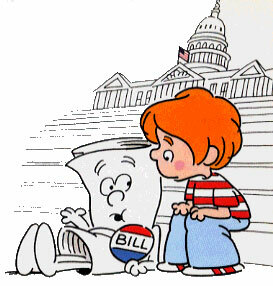 At the next step, both the House and Senate grant each committee the authority to make their own rules on how they are to consider bills. Once referred, committee chairs generally decide to further refer a bill to a subcommittee, hold hearings, subpoena evidence and witnesses, call ‘markup’ sessions to propose and debate amendments, and finally to schedule a vote to report bills back to the chamber floor. If a committee chair wishes to kill a bill, these procedural powers provide wide, though not absolute, authority to do so. Jockeying for a chairmanship is therefore big game in the life of a legislator. Ultimately, members are nominated and elected to their respective committees and chairs according to the rules of their parties’ caucus or conference, and upon a vote of approval on the floor. Seniority is only one factor in these votes, and so because nothing is predetermined, these intraparty contests can explain a great deal about member behavior. With that background to help triangulate Capitol Hill politics, we should now be better equipped to look into the cannabis bills pending before the 115th Congress, the committees to which they have been referred, and their procedural status. Stay tuned for the next article in this series when we will begin our bill-by-bill review. Members of Congress last week announced the formation of a ‘Congressional Cannabis Caucus’ in order to organize and affect cannabis policy at the federal level. Representatives Earl Blumenauer (D-OR), Dana Rohrabacher (R-CA), Jared Polis (D-CO) and Don Young (R-AK) announced the creation of the caucus on February 16th. Cannabis advocacy and drug policy groups were quick to commend the formation of the organization. The members of Congress that formed the caucus all represent constituents in states where cannabis is legal for medical and adult use. “The formation of this caucus is a testament to how far our country has come on the issue of cannabis policy,” says the joint statement by the drug policy reform groups. “We look forward to working with caucus members to translate this growing public sentiment into sound public policy.” According to their statement, 44 states so far have adopted laws effecting cannabis prohibition on the state level, representing 95% of the U.S. House of Representatives and 88% of the Senate. Representatives Blumenauer and Rohrabacher have been prominent cannabis policy reform advocates in the past. Blumenauer supported the bill to legalize adult use cannabis in Oregon back in 2014 and Rohrabacher introduced the Rohrabacher–Farr amendment to Congress, which prohibits the Justice Department from spending money on interfering with state medical cannabis laws. According to an article on Roll Call, Blumenauer says the caucus will focus on more medical research and the tax and banking regulations hurting cannabis businesses.